mwe3: The CD liner notes for Dark Sonatas speak about the influence of Elliott Carter, who tragically yet quite coincidentally had died the day before the Dark Sonatas album was recorded. What effect did Carter and his spirit have on the making of the CD and what music or recordings from Carter would you cite among his most influential? Amazingly he lived to be 103 and his last work was actually completed a few months before he died. What a way to go .. but we should all live to be a hundred. Kevin Kastning: The music of Elliott Carter has long been a tremendous influence on me and my music. Mark and I maintain a long-running discussion about his work, as Mark has also been impacted by him. We very deliberately set out in the recording sessions for the album that would become Dark Sonatas to structure our real-time compositions using principles and concepts of Carters; not to base any of our pieces on any of his or directly or indirectly quote any of his work. We debated for a long time after the sessions were completed whether or not we would publicly reveal or refer to Carters work and the impact it had on this record. Eventually we decided that we did want to explain the genesis of the record and did so in the liner notes of the album. We felt that since the material on this record was so different from our first two albums that an introduction to the overall concept might help provide a kind of entrance into the works for listeners. I also considered that revealing the concept and his influence would be a good way of acknowledging his work and influence, and in some small way, showing gratitude to him and his work. We didnt know at the time of the recording sessions that he had passed; we heard of it the following week. He had died literally while we were in the studio, recording this album that was so influenced by his work. I was crushed when I found out; I mean, I know he was 103, but it was still upsetting news to me. He was still active and still writing. I had met him and so I felt his loss not only artistically, but personally as well. To answer your question about which music of his was most influential, for me its the string quartets, absolutely. His string quartets, especially Nos. 1 and 3, were and are an awakening for me. For preferred recordings, the set on Sony with the Juilliard quartet. Every time I hear them, they just drop me to my knees; they have a tremendous impact. I hear something new in them with each listening. 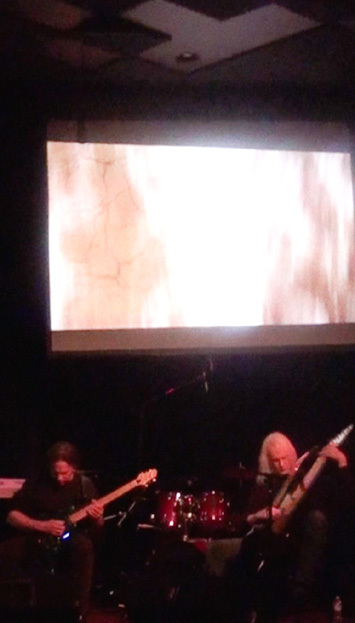 Mark Wingfield: Like Kevin, Elliott Carter has been an influence for much of my musical life. I still remember the first time I heard it, I must have been 20 or 21. I was listening on a car radio and I heard what sounded to me at the time, like a nightmarish orchestral vortex, a seething mass of sound. It was unlike anything I head heard in my life, I was completely transfixed. His work has been an influence ever since. Its not that I think I have directly referenced any of his material in my own work, its more like the emotion, spirit and concepts of his work have informed my musical vision. It did come as a surprise to me when I found out he had passed away as we were actually recording the album. On a personal level it seemed an amazing coincidence. Though I don't hold anything by coincidences, it still has an emotional effect on me when I think about that session. As Kevin says, we were both in two minds about whether or not to mention Carter's influence on the music. But in the end we decided that since we had sat down to record with the explicit idea of basing the music on Carter's work, it seemed right to mention it. mwe3: Why did you call the CD Dark Sonatas and can you explain the concept behind the sonata structure as it applies to the album? The term sonata goes all the way back to the Baroque era and also 20th century composers used the sonata too. In what ways did you apply the sonata concept on the new CD and would you say Dark Sonatas is more jazz based or 20th century neoclassical in form and structure? Were jazz and classical tonalities applied on the CD? Who came up with the song titles? Theyre not in English which I noticed! 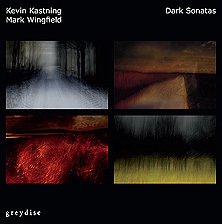 Kevin Kastning: I suggested that we title the record Dark Sonatas for a couple of reasons. I felt that some of my tunings I used on the record, and some of Marks patches were rather dark in densities and atmospheres. I wouldnt say that there are any jazz elements on this record; both harmonically and melodically, as well as structurally, this is more of a 21st century classical work. In the album title, Sonatas to allude to the classical influence of Elliott Carter, and when I was listening to the rough mixes of the recording sessions, it occurred to me that some of the pieces sounded like a 21st century version of violin sonatas in some places. We didnt adhere to the rigidity of the sonata form as it applies to sonatas from the classical period, or even into the romantic period when the definition of sonata form began becoming a bit more fluid. While there isnt a concrete representation of the typical sonata components such as exposition, development, and recapitulation; or a three- or four-movement structure, there is the overall concept of the sonata as a principle, an approach to shaping a single composition. Sonata was also used in this instance to allude to the classical format of a duet consisting of piano with a solo instrument. Again, in passages of some of the pieces, you can almost hear what Im doing functioning as a piano part, and what Mark is doing functioning more akin to something like a violin part. I also hear these works as more dense than our previous works. I think I may have a mild form of synesthesia, and I hear these deep densities as darker in colors, which also impacted the album title. The titles are more aligned to the centuries-old classical compositional naming convention wherein movements within a piece are titled by things like tempo markings. We went more in this titling direction with this album due to the modeling of pieces on more of a classical approach. A few of the titles are in Latin. I think that the album title and the track titles tie in with and connect the overall work in a cohesive fashion. Even the artwork on the album cover is an almost tangible representation of the textures of the pieces and the overall impact. The photography for the album cover and the CD booklet was all done by Chris Friel, a British photographic artist whose work I admire. His work truly fit this album; I think he strongly captured a few of the elements of its essence. Mark Wingfield: I would second everything Kevin said here. Also in many of the pieces there are structures and themes which are stated, then developed and finally returned to later in the piece. Actually two or three of the pieces do, to one degree or other, follow the sonata form in the modern sense of the word, though they were not planned that way. None of the pieces were planned in anyway apart from the intention to create music which, in our minds, related to what Carter's music meant to us. Having said that, before beginning a piece Kevin and I may decide some basic things like tempo, or whether we start together or one of us starts first, or perhaps which registers we start in, but nothing more detailed than that. mwe3: The Dark Sonatas CD sounds quite dynamic. What recording, mixing and mastering techniques were applied during the various stages to ensure the sound didnt distort or overload the sonic spectrum so to speak? Do you think most CD players and speakers going back 20 to 25 years ago (vintage audio gear) can handle the sonic load of the 21st century CD so to speak? What CD players were used to test the sound characteristics of the album in its recorded medium? I hope the CD will be around for a long time but with the push being downloads and what with vinyl making a comeback so to speak, Im afraid the essence and original intent of the CD is becoming a lost art form in some regards. Also when can we expect a DVD from you doing the recordings and what about DVD audio and Blu-ray, how are those for music in your opinion? Kevin Kastning: The recording technique was very simple and pure: microphone into pre-amp into recorder. I didnt use any computers in the recording process; my recorder at that time was the Alesis HD24XR 24-track digital recorder, which is a wonderful piece of gear. Sadly, not long after the sessions for Dark Sonatas, it died. It had recorded a lot of albums in the years I had it, and I was sad to see it go. Its been replaced with a Tascam X48 Mk.II 48-track digital recorder, which is truly an order of magnitude beyond the HD24. This recording process makes for a very dynamic recording, both in frequency response and actual dynamics, as no EQ, limiting, or compression are used during the tracking process. Regarding blu-ray, I think its a superior medium over the audio CD. I hope to see it get more widely adopted as a high-resolution vehicle for recorded music. Regarding a DVD of Mark and I, there are no plans for that. We do have some videos on YouTube, and a recent concert performance in New York City was filmed; no doubt that will find its way to YouTube as well. We recorded our next album in August 2013, and parts of those recording sessions were also filmed. Ill let Mark speak to the mixing and mastering processes. Mark Wingfield: The mastering used the PSP Xeon limiter, which does not allow any digital clipping. Some older CD players cannot handle full scale digital and may distort if the digital signal approaches full scale, but it shouldn't be a problem with older amps and pre-amps or any reasonable quality modern CD player. The Xeon is the most transparent limiter I have ever heard, hardware or software. One of the things that easily confuses the ear is changes in volume. When you limit a signal, it increases the overall volume. This makes it very difficult to accurately judge what effect the limiting is having on the sound. The Xeon has a button which keeps the audible volume the same as you increase the amount of limiting applied. So you can actually hear exactly how it is affecting the sound. Having said this, we made sure that the only limiting used in mastering was protective. In other words we made sure that only inaudible transients were limited. So the limiter would only be activated for a small number of samples a few times during a whole track. Most music these days has large amounts of limiting applied throughout each track on the album. This inevitably changes the sound of the original recording greatly and it also greatly reduces the dynamic range of the music. For the music we do it was important not to have any reduction in the dynamic range. As with the mastering, in the mixing, no compression was used and sound shaping was done with mic balancing, panning and reverb rather than EQ. I will greatly mourn the lack of album artwork if the CD disappears. That is my only problem with downloads, you don't get the full album artwork and I think that's a great loss. However on every other front I think downloads are a superior medium. Yes mp3s are low quality, but on some services you can download 24 bit wav files and these are significantly better than CD or vinyl. You are in fact getting an exact digital duplicate of the mastered album, I can't see how its possible to get higher quality than that! Also with downloads you can avoid the whole tricky problem of getting the information off the CD accurately. In terms of sound quality, I'd rather put all my money into a great digital to analog converter, rather than wasting half of that on the CD player part of the technology, which is imperfect at best. So I see downloads as the future in terms of quality, nothing else can match it. I only wish someone would come up with a clever way to include the CD artwork with it, but that's pretty problematic. I believe you can get 24bit on blue ray so that's another option for going beyond CDs and vinyl in sound quality, but I don't know if it will catch on in a big way. Going back to vinyl? To my years its just a nostalgia thing, I have no interest in it, its an inferior medium. On vinyl you loose all the stereo in the bass and the dynamic range is much less than even CD let alone 24 bit digital. Vinyl is an antique technology with nothing to offer me personally. mwe3: Kevins 30 string guitar is quite prominent on Dark Sonatas. How did it all blend together for the 30 string guitar with Marks electric guitars? How did you decide which of Kevins guitars, the 30, 16 or 12 string guitar were right for which song and can Mark say something about the guitars and strings he featured on the new CD? Kevin Kastning: Thats a good question. Instrument combinations were usually arrived at by discussions of Marks patch/voice selection and my tunings, determining which tuning would fit best with which patch and so forth, even though he only used a couple during the sessions for Dark Sonatas. 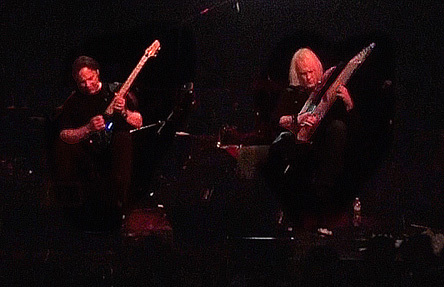 I had the 30-string in a different tuning than the 16- and 17-string Contraguitars, or the 12-string Alto guitar. And the 16-string was in one of my own intervallic tunings, different from the 30-string; the 17-string was in octave tuning. So it wasnt only a matter of which instrument was right for which piece, but which instruments fit together the best. Often my instrument selection and/or tunings had a very direct impact on the shape and especially coloration of the piece itself. Often I would have a shape of a composition in mind, or a specific compositional orchestral texture, and Id reach for the instrument and tuning combination that would allow that shape to appear, exist, and breathe. The strings on all my instruments are by John Pearse. Mark Wingfield: I actually only used the same patch on most of the tracks on this album, there are a few where I used another similar patch. There is one piece called "Sonata di Scuro No. 1" where I momentarily switch in a third patch for a second or so periodically to create a certain effect, but apart from that almost every track uses one of two patches. These are based the Roland VG-88 which is a guitar audio effects processor that allows you to go in a lot deeper to adjust the sound than any other processor I've found. Some people confuse this with a synth, but its got nothing to do with synthesizers, its an audio signal processor that shapes and processes the guitar signal. The guitar I used was a Patrick Eggle LA Plus which has been my main guitar for years. On the recording session Kevin and I did in August I employed a whole new approach to sound processing. Although the VG-88 remains at the heart of my sound, I am now feeding that into a laptop. Once in the laptop I can bring a whole new pallet of sound shaping devices into play. So for the August session I had a whole host of processing at my finger tips. For example I had three different EQs, some subtle distortion and a limiter which allow me to bring out a breath like sound from my guitar. I can fade this configuration in and out very subtly while playing using a Vmeter touch strip attached to my guitar. I also had two Sinevibes Turbo wave shapers with different settings which I can switch between and fade in using a pedal. Artemiy Pavlov at Sinevibes has been great and worked with me on adding some new features for the Turbo to get the sound I was after. Its a truly innovative company with great sounding plugins. I also have a very subtle EQ and distortion channel which I can switch in on the main guitar sound which consists of three Waves plugins; an emulation of an SSL desk channel which adds some nice but very subtle distortion to the texture of the notes, then an 1176 compressor emulation which again adds some subtle distortion but also affects the attack phase of the note in a very subtle but pleasing way and finally an API 550B EQ emulation which adds yet more subtle upper harmonics and a fair amount of very unique upper mid EQ with tight Q. Together these add a very nice, but very subtle texture of distortion to the notes along with some subtle attack shaping and frequency emphasis. Its a magic combination which works really well with one of the patches I use. I also used this on one or two tracks on Dark Sonatas. Again this can all be switched in with a foot pedal connected to the laptop. One other thing I'm using is an LFO modulated frequency shifter which I fade in occasionally for a raspy tone. I'm using all these things live now as well as in the studio. The fact that laptops are now fast enough so that you can play through them in real time with no noticeable latency, has really opened things up for me. I'm using a Macbook Pro Retina with SSD and a TC Studiokonnekt 48 audio interface. The latency with this set up is super low to the point where its the same as the delay I'd get if my amp was a little way behind me on the stage. As it happens I'm not using an amp and listening through monitors right next to me or headphones. So it all feels very natural, I don't detect any latency when playing. I think software developers are just scratching the surface of what's possible in terms of expressive effects. Too much of a plugin developer's energy is spent trying to recreate antique technology in my view. Perhaps that's where the money is, so I certainly don't blame them if that's the case. But there are so few developers who are really doing anything new with this technology and I can't help feeling there is a huge potential there. There are companies who really are doing something new like Spectrasonics who make the Omnisphere synth and some smaller software developers like Sinevibes and Michael Norris for example. But with most plugin developers you just see the same old set of effects reproduced time and again by company after company, each claiming that their sound more like the antique hardware of the past. I mean I am using some of this stuff, like the Waves emulations, which are superb, but I think of them as subtle, but very nice sounding distortion devices and I use them as such. I'm not knocking Waves, I love their plugins, I think they're a great company and I totally depend on their plugins. But I think the doors are wide open in terms of innovation in audio software and there is so much uncharted territory to be explored. My advice to any software developer who wants to do something really innovative for musicians in this field, is to stop thinking in terms of software or audio techniques, such as frequency shifting, bit crushing, EQ etc... and start thinking in terms of timbre and musical texture. Rather than taking a technique like frequency shifting and exploring that, think of how a musical note could be shaped and reformed in new, but musically satisfying ways. These might employ a whole host of techniques. But the musician doesn't need to know how you do it. What would be useful to a musician would be a slider which says "oboe" at one end and "trumpet" at the other perhaps. Or a slider which says "buzz" at one end and "velvet" at the other. Or "voice" at one end and "hollow pipe" at the other. These words would be an indication of the timbral direction the sound shaping of the audio signal would go in. But when the slider is moved, a whole lot of different techniques would come into play, formant shaping, wave shaping, EQ, or whatever was needed. Not just one technique. I think that's the sort of thinking which will produce truly revolutionary musical processing and move us forward from simply aping the past. Kevin Kastning: Again, no computers used during the actual recording sessions and process. Though I do use a hard-disk recorder, which is arguably a kind of computer, but Ive not made the transition to ProTools. I do embrace and welcome the digital recording revolution. I started work in recording studios well before the digital days, and I even then I saw analog tape as a very imperfect medium with loads of limitations and forced tradeoffs. Back when tape was the only medium, I didnt like it even then. One key point that I think gets overlooked is that no matter how far digital technology progresses, there will never be a plug-in for a great room. In other words, digital is a fine recording medium, but the recording is only as good as the studio (live room) in which it was recorded. And theres the entire issue of microphone selection and placement, which is massively important, but it all begins in the actual room itself. Obviously this is more key with acoustic instruments, but the import of the room itself cannot be overlooked. I dont think recording studios will ever be a thing of the past, though many of the great ones have shut down in recent years. I actually see our present day as a kind of Renaissance in recording technology. Mark Wingfield: If you are recording digitally these days you are recording to hard disk. It makes no difference if you are recording through an audio interface to a computer or a dedicated hard disk recorder, which these days has a computer in it anyway. The only thing that's important here is the quality of the analog to digital converter you're using. Assuming you have a good quality analog to digital converter, sound quality is all about mics, mic placement, mic pre-amps, the sound of the room and the sound of the instruments. The album was mixed on computer because the only other way do it is to convert the signal back to analog, where you'll loose some quality, mix through an analog desk and other hardware, where you'll add some noise and distortion, and then reconvert it to digital, where you'll loose some quality again. I can't see the point in that in 2013. Unless of course your mixing technique requires a physical mixing console and turning of physical faders and knobs. I totally respect that for some people this is the case and they get great mixes that way. These notable exceptions aside, I hear a lot of mixes coming out of the analog world that to me sound clouded in a subtle haze of analog distortion. Some people like that. I find it obscures the details. I guess even that can be an advantage with some music, but I prefer the clarity, detail and openness of the sound you get mixing in the digital world. In fact once the signal from the instruments is recorded to digital, it makes sense to me, to keep it there all the way to the listener's playback system. If their system can handle your recording sample rate, say 24 bit 96 KHz, then they are receiving the exact same quality audio you recorded, mixed and master at. mwe3: Whats been the reaction to the different albums youve recorded and are there different reactions in different parts of the planet to your music? Do you receive much support in Asia, Australia and Europe? Are you planning any live shows or tours to introduce your music in other parts of the world and are there other plans to further the exposure for your music in the future? Kevin Kastning: Critically, the albums have been really well-received; some have won some nice awards, too. My 2012 release The Book Of Crossings with Sandor Szabo was named as one of the Top 10 Albums of 2012 by Acoustic Guitar magazine, and FAME Magazine listed it in their top 15 of 2012, so this kind of recognition is very humbling and I am grateful for it all. The first two records of Mark and I were both named to New York City radio WFMUs Favorites of the Year list for 2011 and 2012. With regards to other countries, Australian radio and the CBC in Canada have been incredibly supportive. Aside from Japan, Ive not had much airplay in Asian countries, at least of which Im aware. In the US, NPR stations have been very supportive of my music for many years now. I also receive airplay in various European countries, and each time I tour in Europe, Im surprised at the size of the audiences and their enthusiasm and their knowledge of my music. Mark and I have been discussing small-scale tours for our music in both the UK and North America. 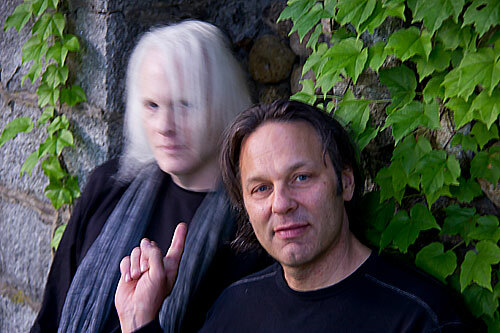 Sandor has been speaking to me about doing another European tour in 2014. My partner Carl Clements asked if Id be interested in touring with our music, and yes I would. It seems that my music does better in Europe than in the US, and Im more known in Europe than here. Though I have received some very touching emails from listeners in the US; a few have told me how much my music means to them and for this I am very thankful. In the U.K. I get regular BBC air play and also radio play in other parts of Western Europe. In other parts the world, Japan for example, I know I sell CDs but I have no idea about radio play. Amazingly, an old high school friend contacted me recently out of the blue, he'd heard my music on the radio in Tennessee of all places. I never would have known this if he hadn't got in touch, so its hard to know exactly where you're getting played. Some of my albums have also received a lot of critical acclaim, my recent album Cinema Obscura with Rene von Gruning and Iain Ballamy was one of the London Jazz top ten albums of the year. Guitar Player Magazine has run two major features on me, the second one included Kevin. So all this helps a lot. I feel very grateful for all this and lucky because the type of music I do often falls between the cracks, its not exactly rock but its not straight ahead jazz either and there are classical elements in the composition side of it. As for touring, I'd love to tour with Kevin and I am hoping we can arrange U.S. and U.K. tours in the near future. mwe3: What plans are shaping up for the next CD and how about other writing and recording plans for you and your music, labels and various guitar technologies in the coming months and years? 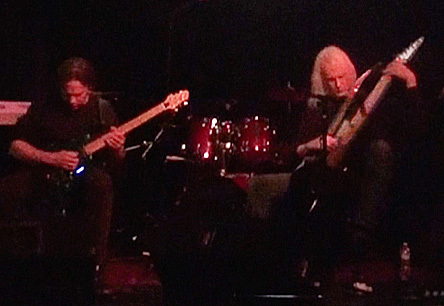 Kevin Kastning: In August 2013, Mark and I completed recording sessions for our next album. That will likely be released in early 2014. This one continues our progression, as Mark was using some new gear which extended his potential for expression and textures. And for the first time in my life, I used only one instrument for the entire recording sessions: the Emerald Guitars Kevin Kastning Signature 30-string. I utilized various tunings on it, but everything was recorded using the 30. While it may seem that limiting myself to one instrument for a complete recording project is a limitation, the truth is that the 30-string is so deep and vast that is it anything but a limitation. It is in fact a very freeing and expansive instrument; its like playing an orchestra instead of a guitar. 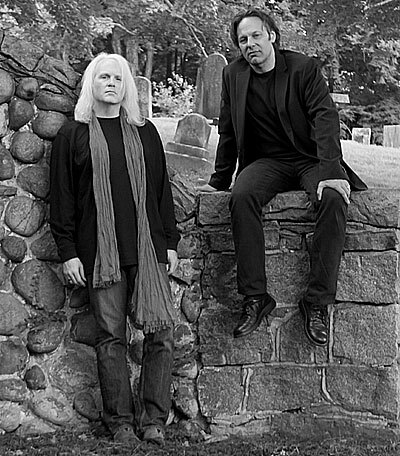 For other recording projects, Carl Clements and I return to the studio in October to begin work on our next album, which will be released in 2014. 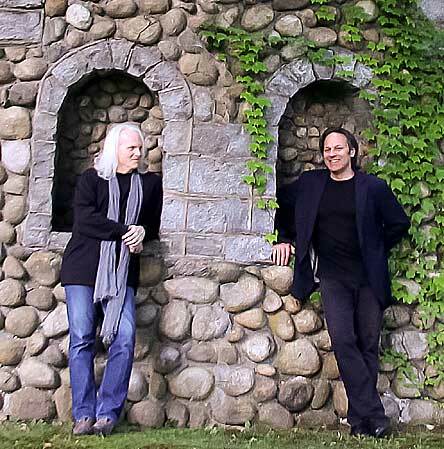 Sandor Szabo and I will be starting work on our next album this fall as well. Actually, were working on about three albums at once, but well be focusing on just one in the fall. This will be a very different and unusual project for us. If youve been following our projects over the years, youll know that for me to say that this one is going to be unusual is really sayiojects are confirmed. I have three or four more with other artists that are tentatively slated for 2014; more news will be available on those soon. Work on my solo album is also slated to begin late this year; actually, writing for it is well underway at present. For instrument projects in the works, Im working again with Dan Roberts at Daniel Roberts Stringworks on a 20-string classical. Im also working with Emerald Guitars in Ireland on the next Kevin Kastning Signature model; this will be a 36-string instrument. Im very excited about both of these new instruments, and am sure theyll both find their way onto my solo album; as well as the upcoming recording projects and concerts in 2014. 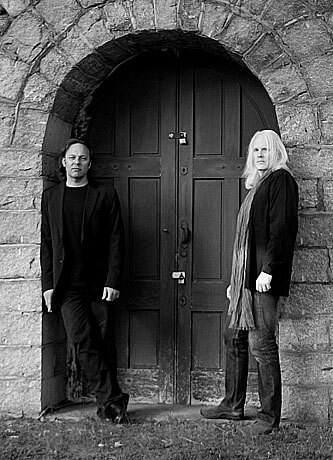 Mark Wingfield: Kevin and I have at least two more albums worth of material recorded, we are currently planning to release another one early in the new year. I am currently recording another album with harpsichordist Jane Chapman and have two more band albums scheduled. As for composing I've been asked to write a solo piano piece for the renowned classical concert pianist Kathryn Stott and I am currently writing material for the upcoming band albums I mentioned. Guitar technologies are something I'm exploring on an ongoing basis so I'm sure more interesting things will happen. I find that new sound manipulation techniques require new playing techniques, and it takes time to develop this. Having just opened up some new areas for myself with sound manipulation on the laptop, I'll explore those for a while before moving on. mwe3: Mark, whats been the reaction to your latest album with René von Grünig, Cinema Obscura? Its another great CD from you. Mark: Thanks a lot. We had good reactions actually. London Jazz, which is the main review place now in the U.K. and is an online reviews site. They made it one of their top ten albums of the year. I was really pleased about that. mwe3: You mentioned the economy has impacted your ability to tour with René and that big band on Cinema Obscura. How has the economy impacted your music? Mark: England got hit even worse than America. Were still in a bad way over there, in fact people are pretty scared I think. The average person is left in a very worried situation. Its not picked up at all since the crash. mwe3: How are you dealing with the problems regarding music downloads which entails even less of a committment from the record label? Mark: I agree with you. I think it does cheapen the whole thing. Economically, it undermines the whole industry. Kevin: I dont really see CD completely going away. People were predicting the death of vinyl and vinyl never really went away. In fact, its coming back in a lot of circles. I dont like the whole downloading alternative however, there are some new sites like HDtracks.com and some of the classical labels are offering higher res downloads which I think is a really cool. If theres anything cool about downloading, its that. Your whole recollection is gone if your hard drive crashes. I think thats just ludicrous. Mark: My personal view is vinyl is just a kind of trendy thing thats gonna disappear because Im not a believer that vinyl offers an improved quality over CDs. Its worse in almost every way. mwe3: How are you going to change your sound on the next record, the follow up to Dark Sonatas, which youre recording with Kevin right now? Mark: We have changed it! I mean Ive been working on expanding my sound and changing my sounds. Im now playing directly through a lap top whereas before I wasnt. On the sessions were doing right now, everything I'm doing is going right through the lap top. Its the first recording Ive done where everything thats on there is going through the lap top, using software plugins and various things to shape the sound and I often manipulate that as I play using various pedals and things on my guitar and so forth. mwe3: Kevin, theres such a wide difference between amount of diverse music youve recorded with Mark Wingfield who is kind of a guitar hero, kind of the Hendrix for the 21st century avant fusion scene, and the airy kind of Oregon-type sound you get with Carl Clements for example. Do you feel the two sounds puts you in different musical camps? Kevin: I dont know... To me its all kind of branches on the same tree, I guess. I dont see a lot of difference between what I do with Carl and what I do with Mark in that, its all in music. Its music that... its not really able to assign a genre to it. So as far as that goes, I see it as all kind of the same whole. I have different approaches with each person I work with. For example, I wouldnt try to approach the material with Mark the same way as I would the material with Carl. So I just get into it more organically to see what the situation calls for and just kind of allow that chemistry to dictate itself and I just follow along where it tends to go. Wherever it leads. I would agree with you on Mark being a guitar hero. Kevin: Its an interesting way to put it. Actually, I take that as a compliment. Thank you. mwe3: This is 21st century music. Kind of scary dont you think? Kevin: Interesting that you say that its 21st century music. Mark and I were influenced by Elliott Carter who is a 20th century composer, so perhaps the argument could be made that were taking our 20th century influences and bringing them forward into the 21st century and turning that into what will become the music of the 21st century, maybe. mwe3: I was impressed with your guitar sound and I mentioned your music to Steve Hackett. 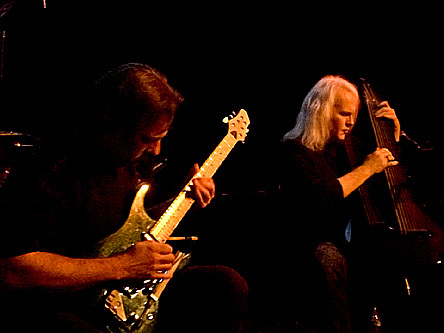 Kevin: I appreciate that you mentioned me to Steve Hackett. He was kind of a hero of mine when I was a kid growing up. mwe3: Maybe you should get the Dark Sonatas CD to Steve Howe to. Too bad YES hardly even has a record label presence in the US these days. mwe3: Im a firm believer in this rising generation of younger musicians coming up these days. Kevin: Well, therell always be great music. You may have to look a little harder for it but its never going to die, its never going to go away. mwe3: Good luck at the show tomorrow night. Are you filming it?